There are over 200 recognised breeds of chicken around the World but not all hens are equal in their laying ability so if you would like chickens for eggs, look at my top 10 laying hens below first. It is commonly accepted that all chickens decended from the Jungle Fowl. Pure breeds of chicken have been developed over many hundreds, even thousands of years from the Jungle Fowl (although science is still challenged by the Auraucana that lays blue eggs). Before the First World War, ducks were the better egg layers and chicken breeds that layed 100 eggs or more per year were considered good layers. 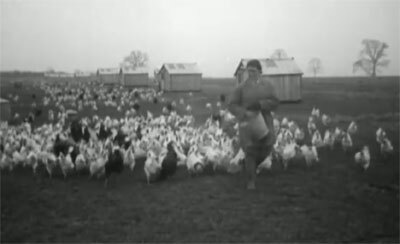 Most of the development of pure bred laying hens came after the Second World War when there were many laying trials and tests and it was common for breeders to ‘trap nest’ hens to record their individual output so that they could be used to produce further generations of laying hens. The developments with pure breeds were soon to be followed by hybrid (a cross of pure breeds) laying hens. There were millions of pounds spent during the 1950’s on creating hybrids that were not only capable of laying more eggs but also had a good feed conversion. During this development, the parent flocks that created these hybrid layers were becoming a different ‘strain’ of their own because hens were selected for egg production rather than the way they looked. Interestingly, duck eggs could have been on our breakfast table rather than chickens eggs… but they did not do well kept in confined conditions like chickens. The following table lists my top 10 laying hens (a mixture of hybrids and pure breeds) and gives an estimate of the number of eggs they are capable of producing if kept in the right conditions. 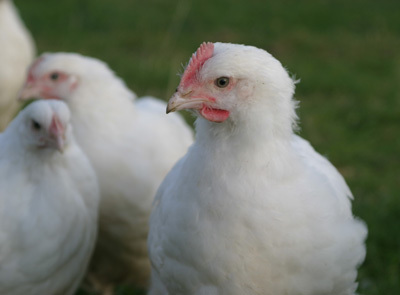 Note that there are many different strains of hens from different breeders that will perform differently… egg numbers can vary on a number of other factors too, particularly with feeding and daylight levels. Exhibition strains that have been closely bred are not usually selected for their egg laying performance. 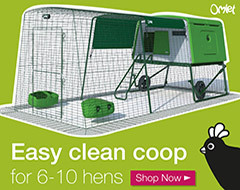 Try to purchase hens from a good ‘Utility Strain’. There are some breeders that advertise utility strains and the number of eggs they expect from their strain every year. Hybrids are much more reliable at producing a given number of eggs and are bred mainly for this purpose. The ultimate egg machine. This little commercial brown hen will lay up to 320 large brown eggs in her first year. 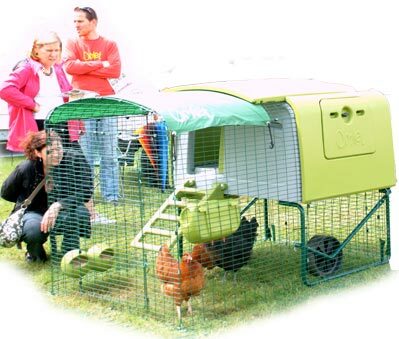 They have a good feed ratio and are very similar to the birds used on farms to produce eggs for the consumer market. A very friendly bird that will be in your house if the door is left open! Small attractive birds with a good feed efficiency that lay up to 300 large white eggs in their first year. These are the standard commercial hen used in the U.S. for egg production (because white eggs are preferred). They can be quite flighty and can fly well so make sure they can be kept securely before you buy them or clip a wing to keep them on the ground. 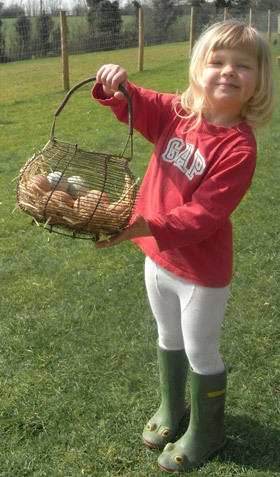 Hardy birds that are great foragers and layers of a good quality large brown egg. The Nera is a cross between a certain strains of Rhode Island Red and Barred Plymouth Rock, originating in Scotland. You can expect around 270 eggs in their first year. 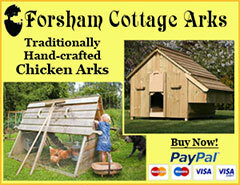 The Amber is a Rhode Island Red based hybrid that looks attractive and has very soft feathering. She is a fantastic layer of up to 300 medium eggs in her first year. The Speckledy is a flecked dark hen, a cross of a Rhode Island Red and Marans. She lays around 270 large dark brown eggs in her first year. The Rhode Island Red is a good layer of up to 220 large brown eggs in their first year. Be sure to get a utility strain though as these are a popular show bird. Good layers of medium to large dark brown eggs. Copper Black Marans seem to be the best layers laying up to 200 eggs in a year. They are often good winter layers, with pullets coming into lay during January. Attractive birds that will reward you with up to 200 medium tinted eggs. An attractive hen with a small crest that will lay up to 180 medium sized blue to bluish-green eggs that will add a little colour to your egg boxes. You didn’t mention blue Sumatrans in your top ten, but these have proved to be phonomenal egg layers for us. They practically look after themselves when free range, perch up in the barn rafters, and their eggs are a lovely blue green colour with tough shells. Thank you for an informative site ????. Thanks for the tip – I haven’t kept these and they aren’t as easy to find but I shall certainly look out for them. We have recently acquired a chicken with our new home! We are a bit stumped as she has stopped laying for 3 weeks now, fresh egg on first day of being here and now nothing! She did have what we think was a stomach upset for the first few days but is healthy now And seems happy. Advice greatly appreciated! It could be a number of reasons, but red mite in the coop is a common one during the summer months. 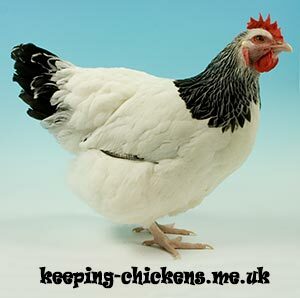 There are some more ideas on the poultrykeeper.com website (search for Why have my chickens stopped laying). Hi, was wondering if you could advise! My friend breeds White Star hens and has told me they are fantastic layers? Are you able to confirm? These are Hybrid hens I think so yes, they should be good layers. Hi, fantastic site. I’m totally new to this and moved in to a little cottage this week that comes with 3 hens and a run. 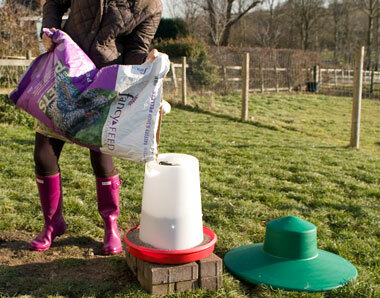 How much feed do you give and do you need to worm them regularly? Thanks you. You can feed them layers pellets ad-lib in a hopper, they won’t over-eat. Mixed corn should be fed sparingly as a treat. No you don’t need to worm unless your chickens have worms – so you can either use a worm testing kit (about £12 from Westgate Labs) or most people worm routinely with Flubenvet every 6 months or so, just in case. Recently I’ve been less willing to do this because of drug resistance so have started using the kits more. My 4 hens have been laying pretty much 4 eggs each day. 3 on 2 occasions. Today we only have 2 eggs is this normal? Or do we have a problem starting? Chicken laying pellets in am. Treats given cooked rice broccoli, cauliflower and scattered treats. Maize given in late afternoon to harden shells. Any other suggestions as to why egg reduction? Thank you. 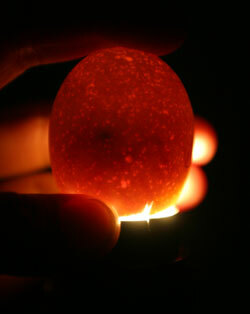 Their peak of egg production, like wild birds is during the spring. At other times, their egg numbers can dip for a while and they can lay at a reduced rate when the weather is hot for example. They will usually stop laying over the winter months. Good information …because I want to become a farmer..these information are most valuable for me..thanks a lot..
We have had 4 Goldline chickens for a week,they have settled in very well i.e. eating preening ect but so far only one egg, when can we look forward to more? They should be laying by 22-24 weeks of age. It can often take a few weeks for them to mature sufficiently before they lay after you’ve purchased them. All I can say is be patient. They could be coming to the end of their laying cycle. Mini eggs like this are nothing to worry about – they are usually caused by a small piece of lining passing through oviduct and getting coated in alubumen (white) and then shelled as if it were a normal yolk, turning it into an egg. Hi there and thank you for this great site. I’ve had 3 chickens now since last February and they were all about 16 weeks old – a white leghorn, a chalkhill blue and a bluebelle. The first to lay was the Leghorn and we get an egg from her every day (pure white eggs). The next was the chalkhill blue – again a good layer who has a ‘day off’ every week (lovely blue/green eggs). Then comes the bluebelle – not a thing! She’s fed and watered just like the others and is always the first in line for any corn and is very inquisitive. She is a beautiful looking bird but has not laid a single egg! Any ideas??? Oh dear. She should be laying by now of course. Other than checking her weight / diet (fat hens don’t lay eggs – see my page on feeding chickens) then I don’t have any suggestions. She could have something wrong with her that’s preventing her from laying I guess. Fantastic site – lots of very useful info, thank you! I’m new to keeping chickens and only got them ten days ago. I have four – one Bluebell, one Sussex, one Amberlink and one Columbian Blacktail. They are settling in nicely and we’re looking forward to starting to get some eggs! I was wondering if we are likely to get any before Winter, as I know they often stop laying over the Winter months. Will this delay their first eggs until the Spring? They are around 20 weeks old now. It depends on their age. If they are ready to lay, you may get some pullet sized eggs now over winter at a reduced rate. If they aren’t ready to lay then they will usually not start until the spring. December is of course the darkest month and the time when you’re least likely to see any eggs. Thank you. Two of them are laying now and we’ve had two eggs every day for a couple of weeks. Four days ago however, there was one egg (from the Amberlink) and one soft shell egg from the Blubell. Same again the following day, but then since then the Blubell hasn’t laid at all (I can tell by the egg colour). What could cause the soft shell eggs and then for her to stop laying? She’s previously laid every day, including two double Yolkers. It sounds like she has just come to the end of a laying cycle – and needs a rest for a while! 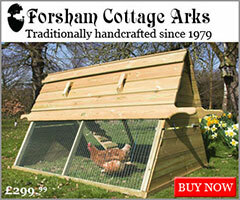 Hens stop laying in the darker months, so you will need to wait until Feb-March for them to start again.